Joshua 1:9: Have not I commanded you? Be strong and courageous. 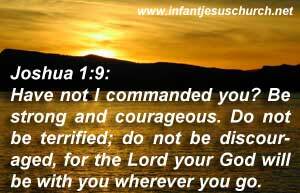 Do not be terrified; do not be discouraged, for the Lord your God will be with you wherever you go. We are never alone! What a promise. God will come with us, through all the seasons of life, through all our ups and downs, through our fail and victory, through temptations and triumphs, even through death. So we can take courage and feel his strength. And no one is not alone! be not afraid, nor be dismayed, at his enemies, numerous and powerful, nor discouraged at anything in ourselves, any unfitness for such service, as we might think, or at any difficulties we might fear from the people we had the government of, and was to lead on; it was enough that the divine Presence was promised us. Heavenly Father, Who is and was and is to come, my redeemer, thank you for this new day. Thank you for being there with us when all others forsake and left us. You are the one constant in our life so full of change. Help us become more steadfast and faithful in our commitments and relationships to honor you and to learn more about you. Through Infant Jesus we pray. Amen.